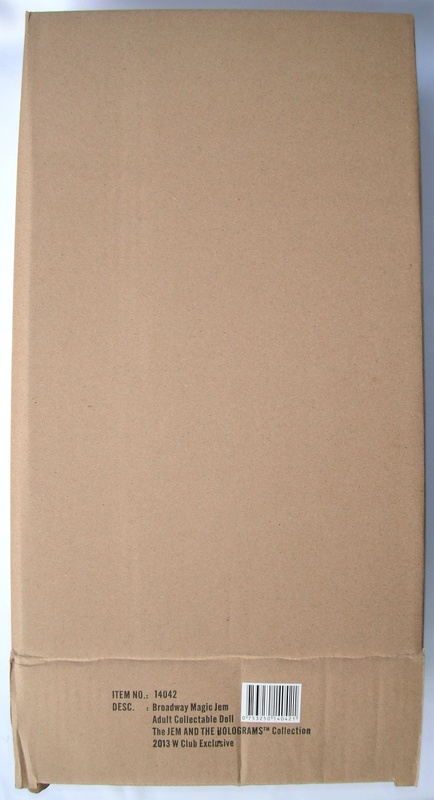 Warning, this is a picture heavy page with no thumbnails yet. 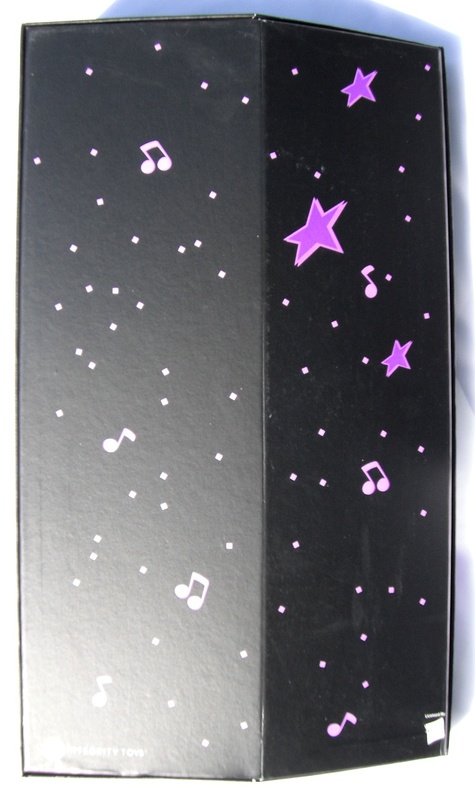 Here's a look at the packaging surrounding the Integrity Toys dolls. 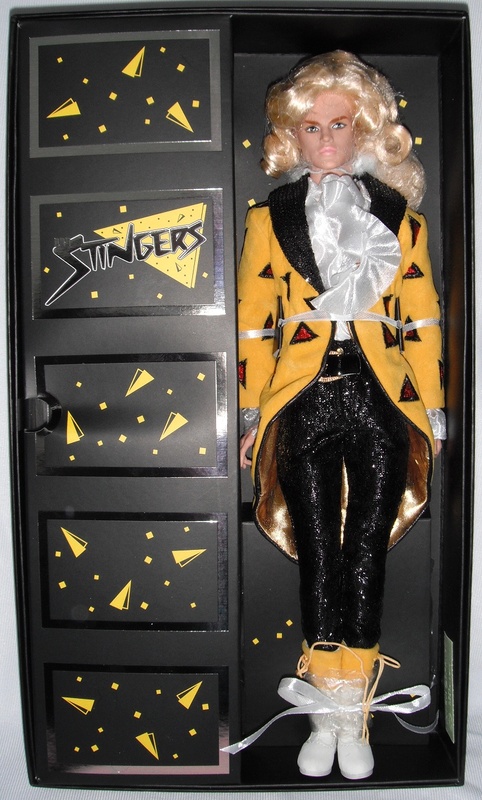 All of these dolls came in high quality boxes with alot of attention to detail. 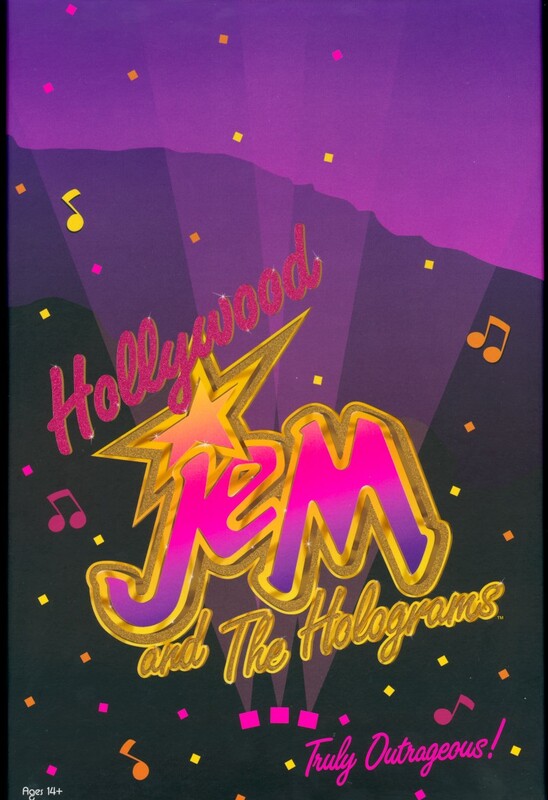 Quite different from what we got in the 80's, but with a retro touch. 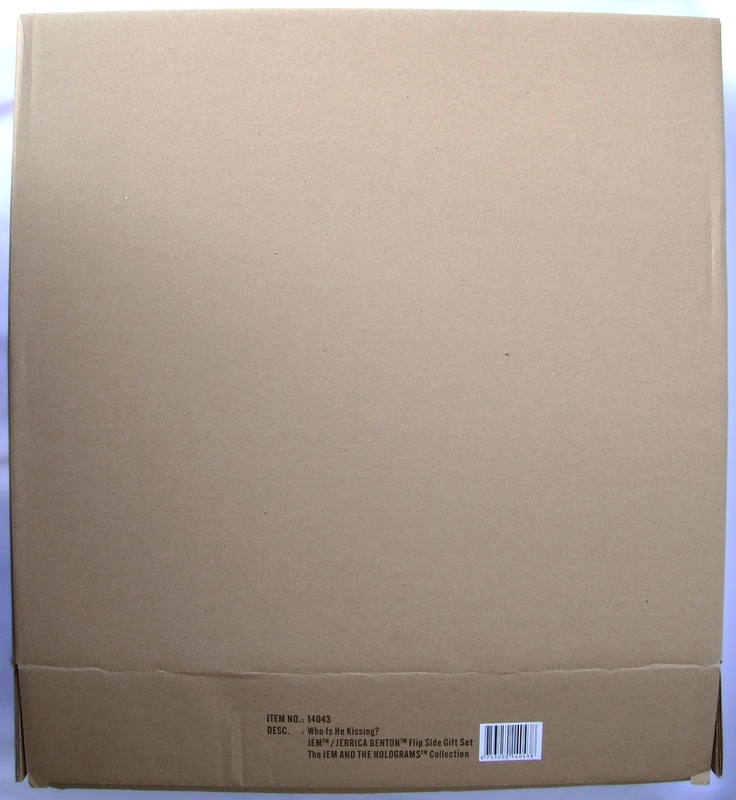 Here are the basic of what the packaging conists of, although the looks of these vary between different waves, characters and specials. 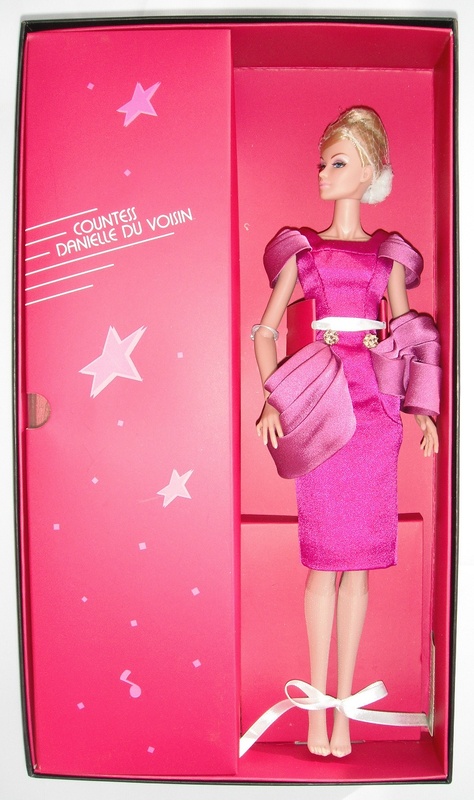 The brown outer carton box which are ignored by some collectors, but has information such as: item number, doll name, whether it's an exclusive, adult collectable doll / Collectible Fashion Doll, and sometimes pincode. 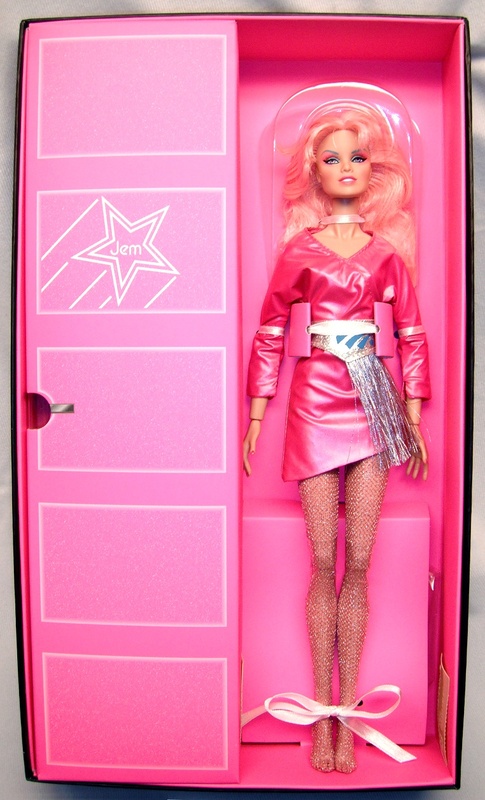 Has a diagonal shape as seen from above (or on both sides as for the double sized boxes), much like the second year 80's dolls. 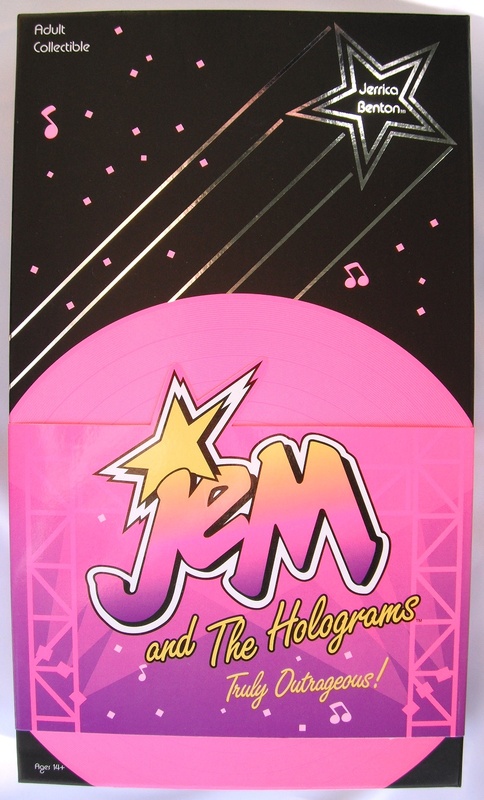 Not sure if Integrity Toys did this for their dolls prior to their Jem line. 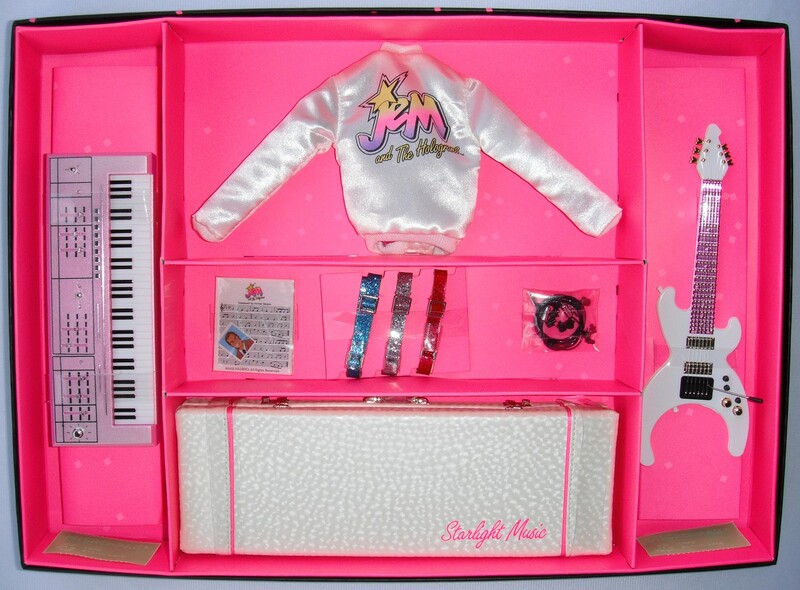 This is the front cover that goes over the back cover (in which the doll and it's accessories are located). 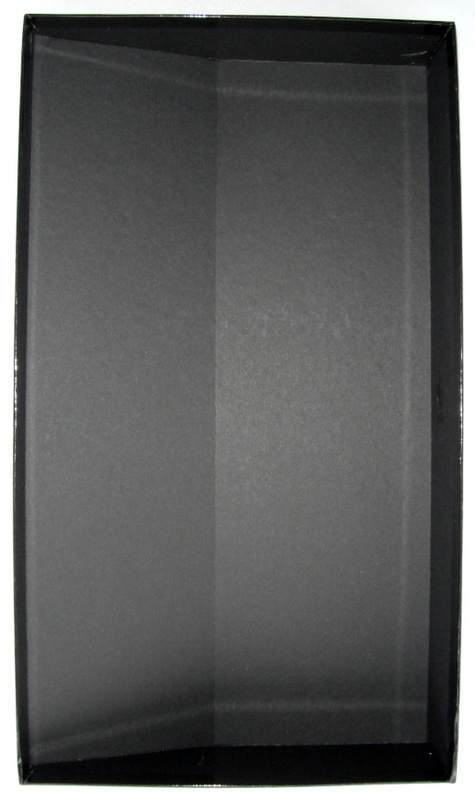 The background is black with a soft matte surface. 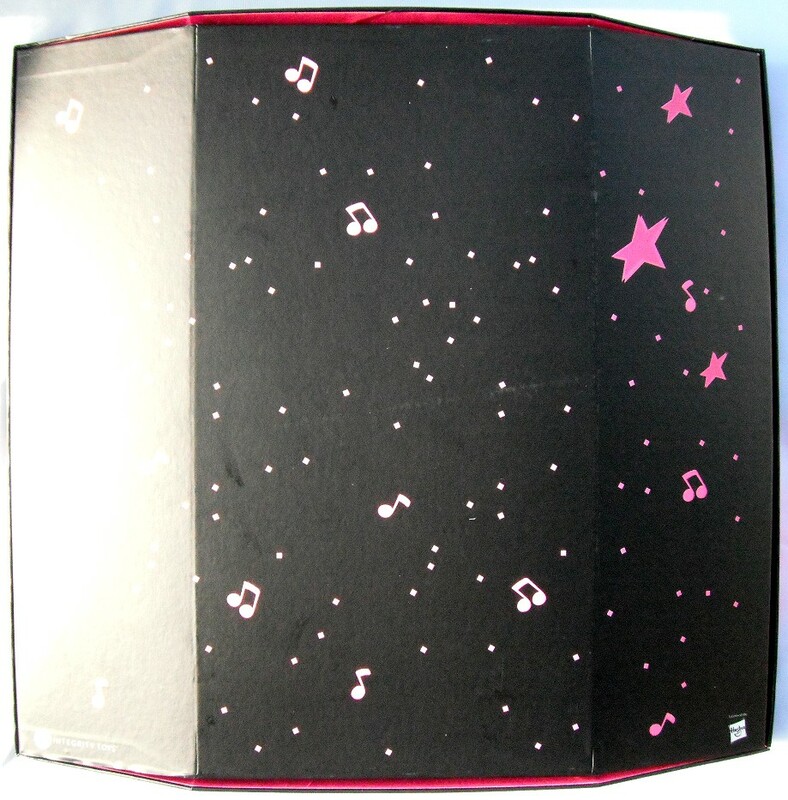 The pink boxes are inspired by the star-design of the cartoon building Starlight Music, it has a chromed shooting star, in which the doll's name is written. 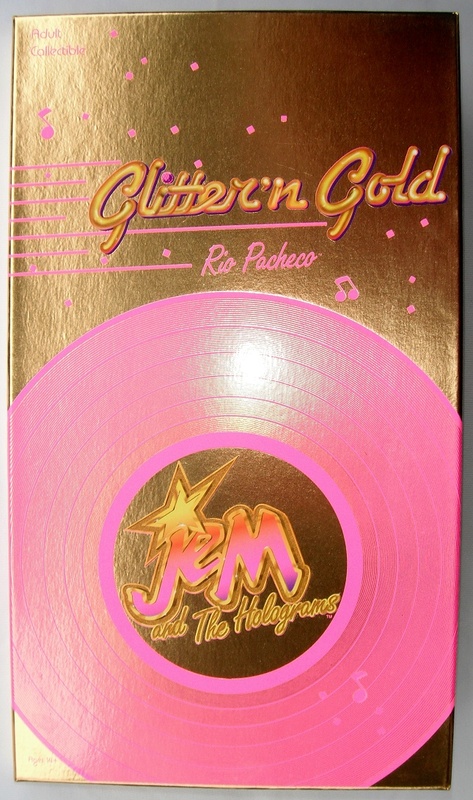 It is surrounded by pink notes and confetti. 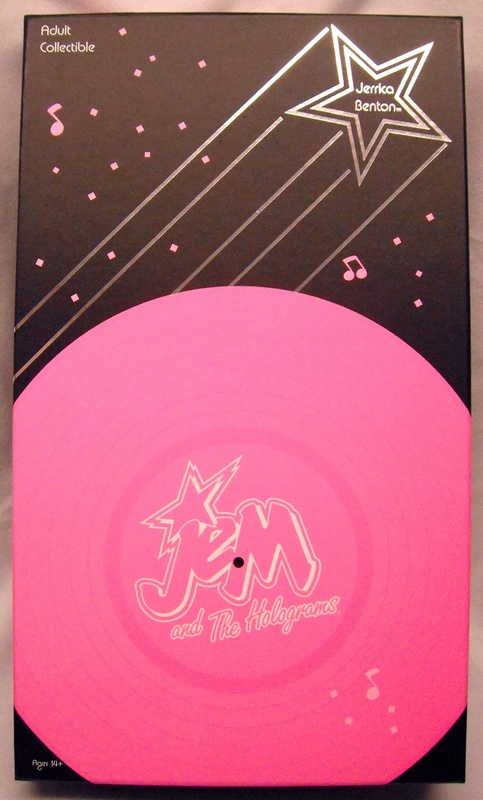 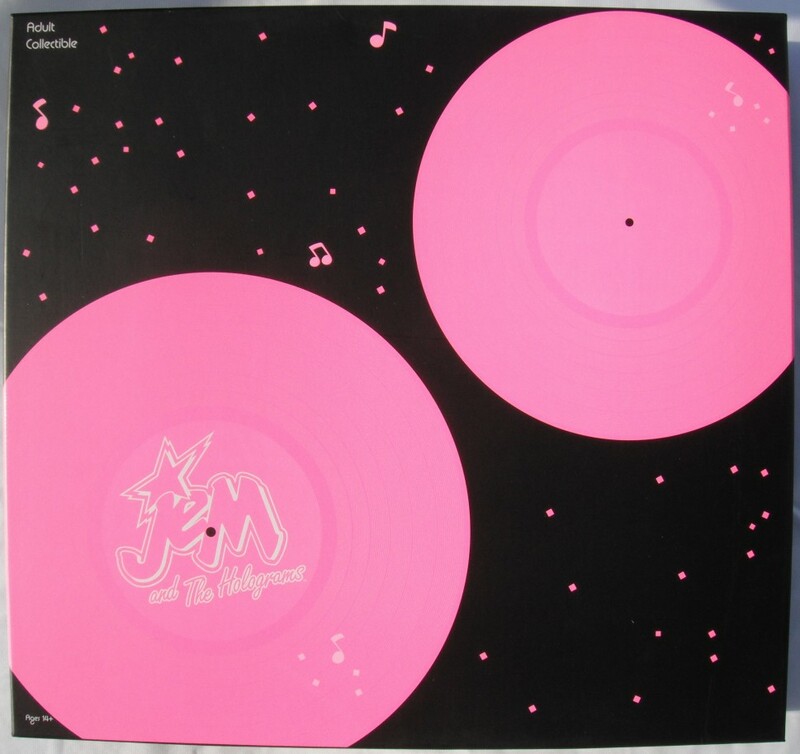 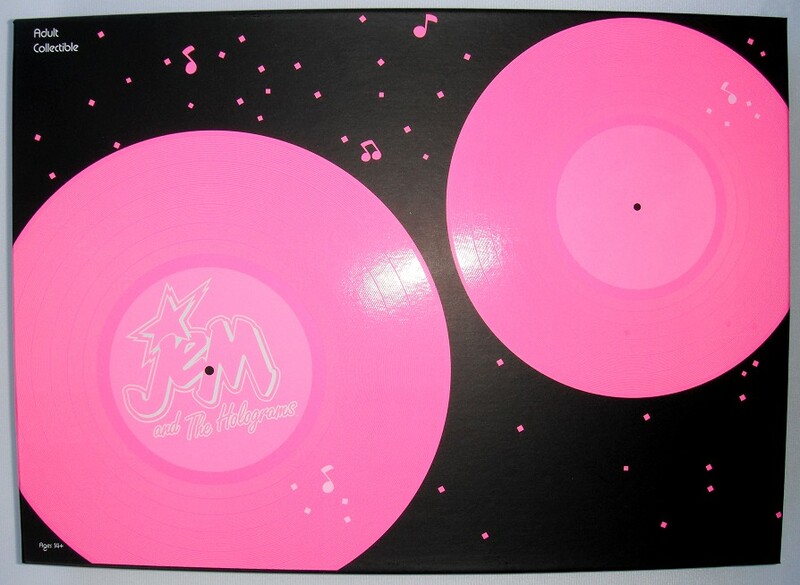 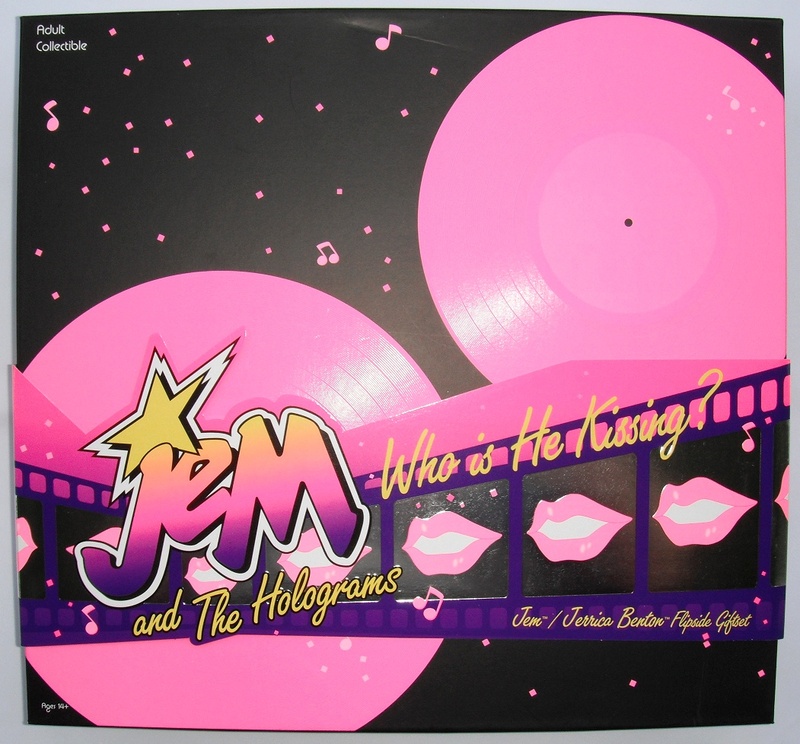 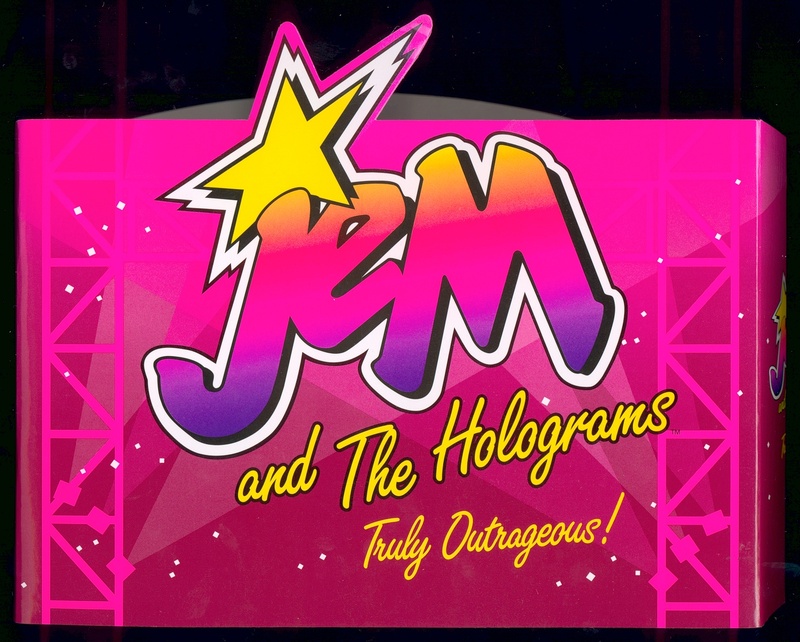 Below is a pink record with shiny tracks and the Jem logo in the middle. 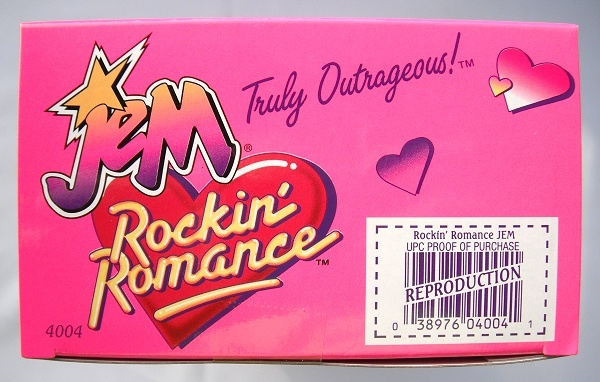 Each cover says "Adult Collectible" and "Ages 14+" or "Ages 15 & Up". 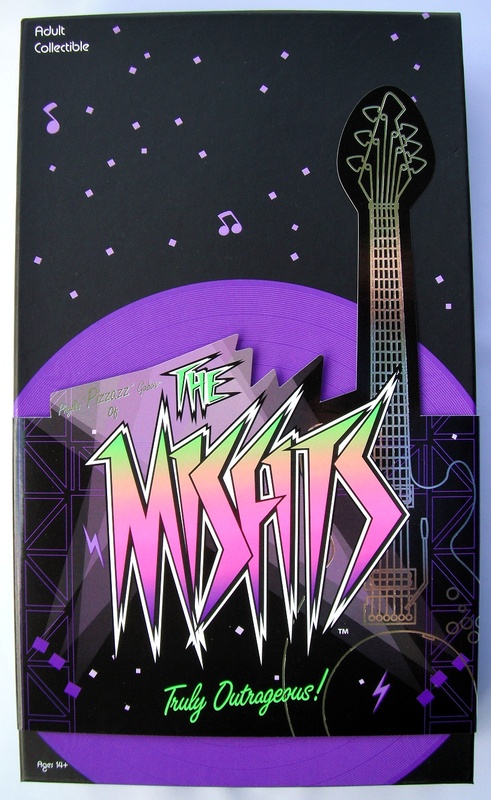 Purple boxes were for Misfits and Clash and had no name written on the box but instead on their sleeves. 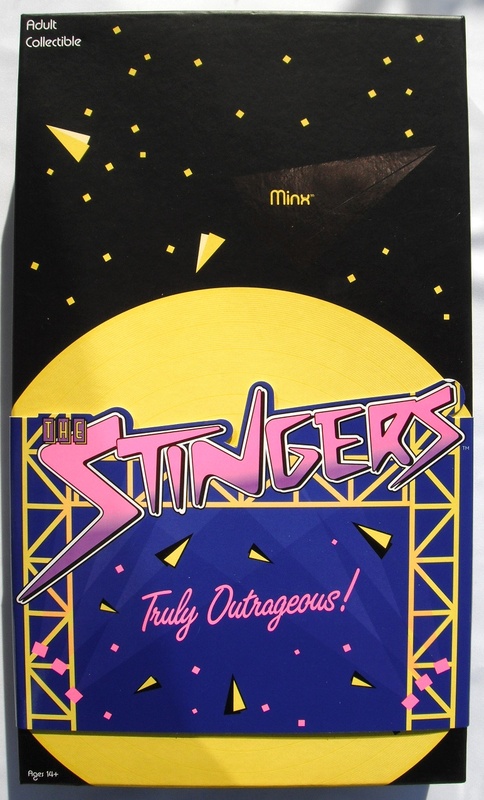 Yellow boxes were the Stingers, which had their names written in yellow inside shiny triangle shapes, and are the only boxes with a black circle inside the record. 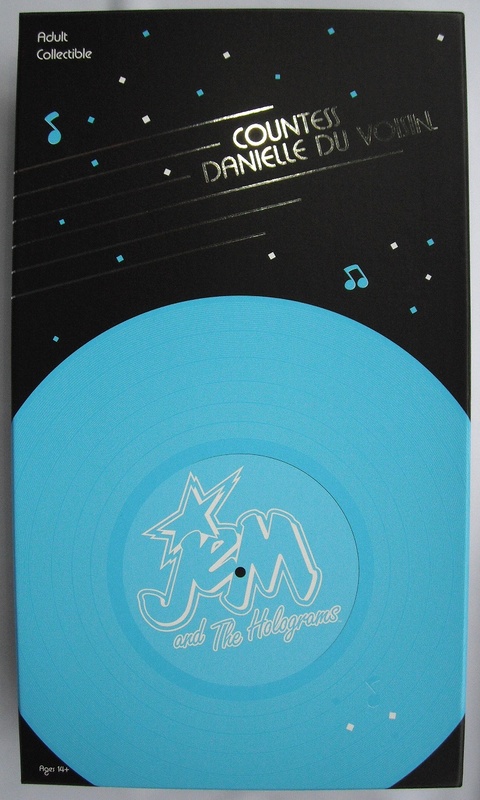 Turqouise boxes are so far only for Danielle, and she has her name written in a new way but in chrome print. 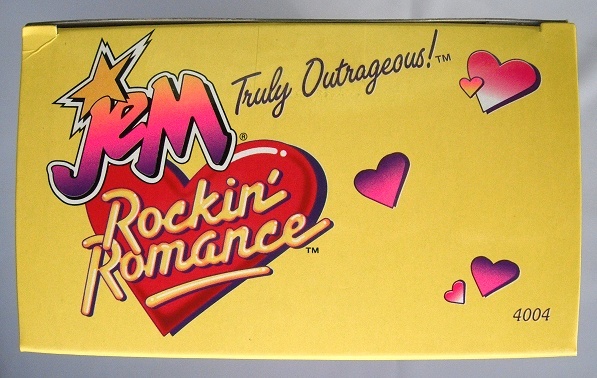 Double boxes had double records and no names. 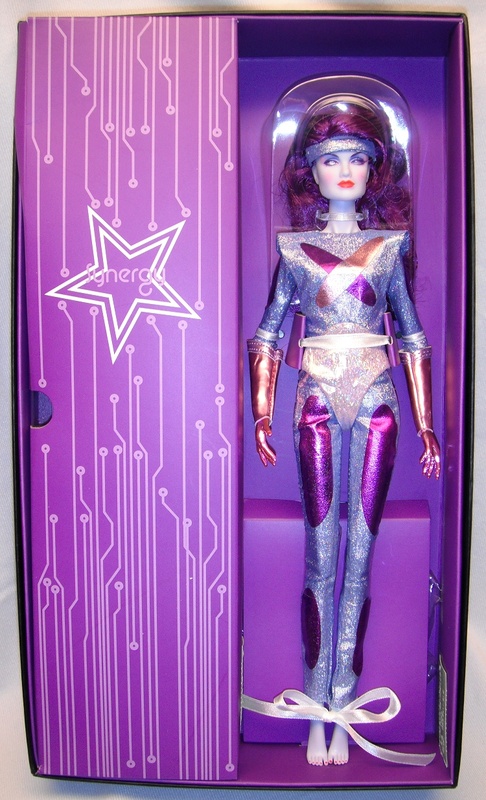 Special releases such as San Diego Comic Con exclusives, had their own and different design and or had more chromed colors. 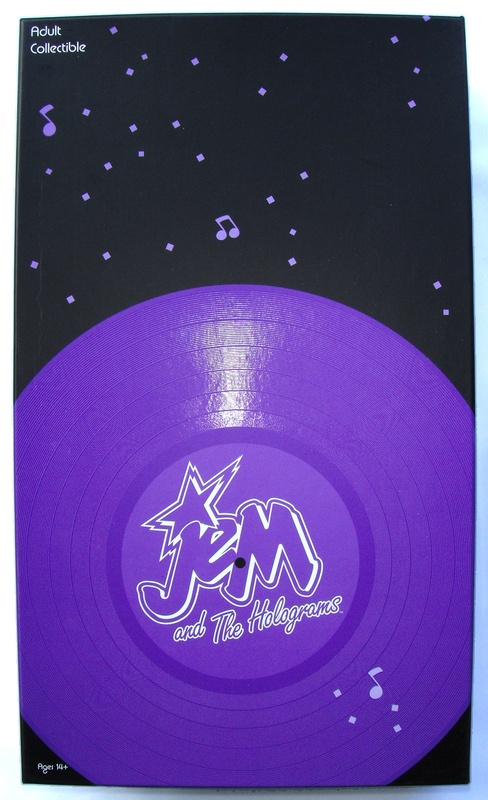 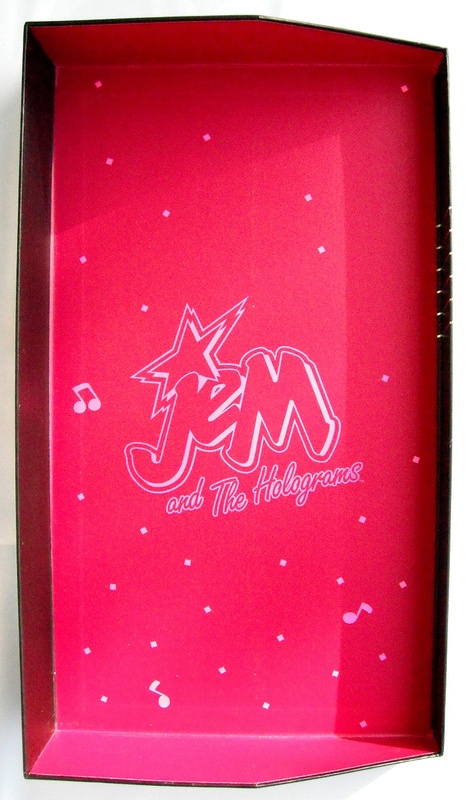 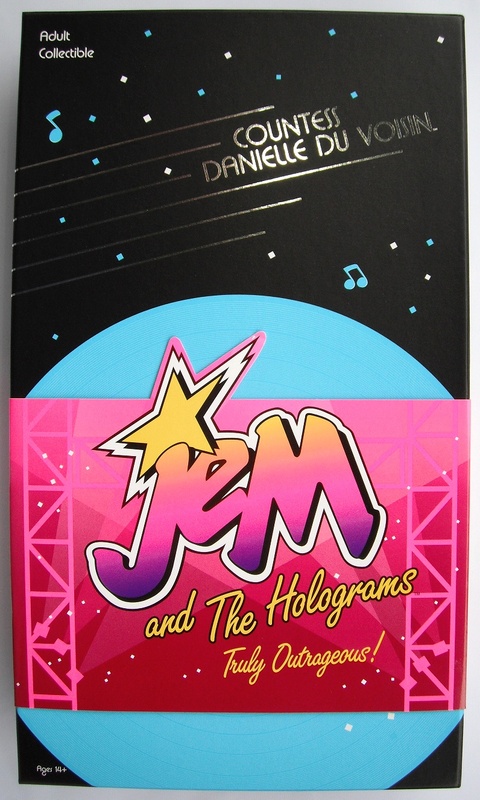 Rockin' Romance Jem had a special retro box created to look like the 80's one, and also came inside an extra chromed cover. 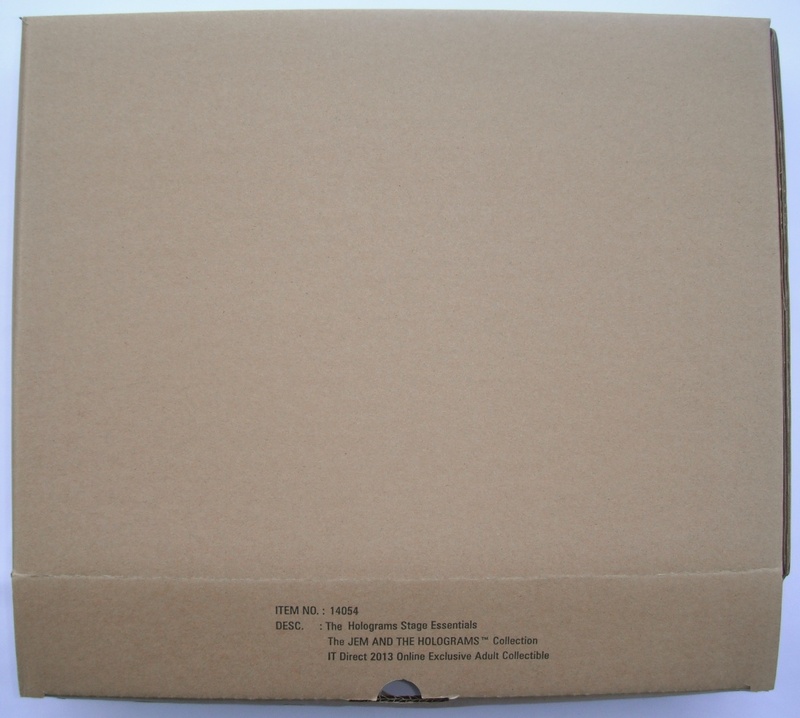 This is what the same boxes look like with their sleeves on. 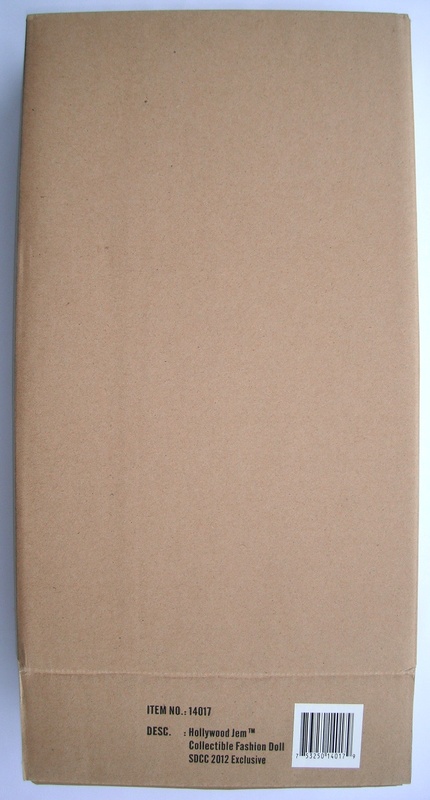 Here are the sleeves without the boxes. 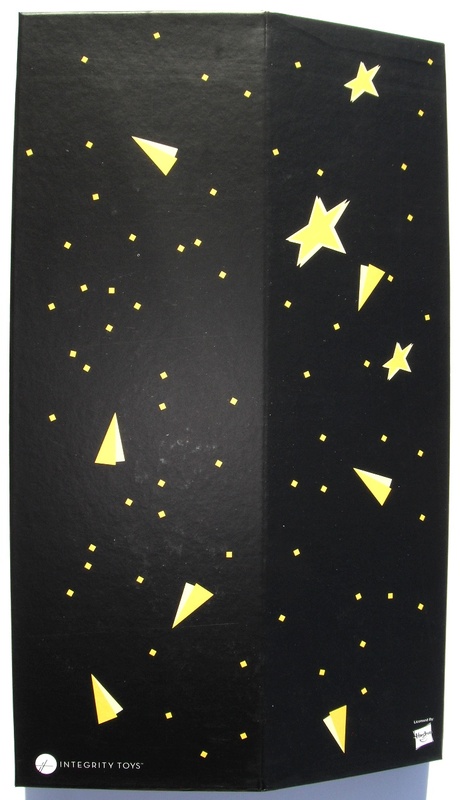 These are shiny paper cutout shapes that surround the boxes to keep the front and back stuck togheter. 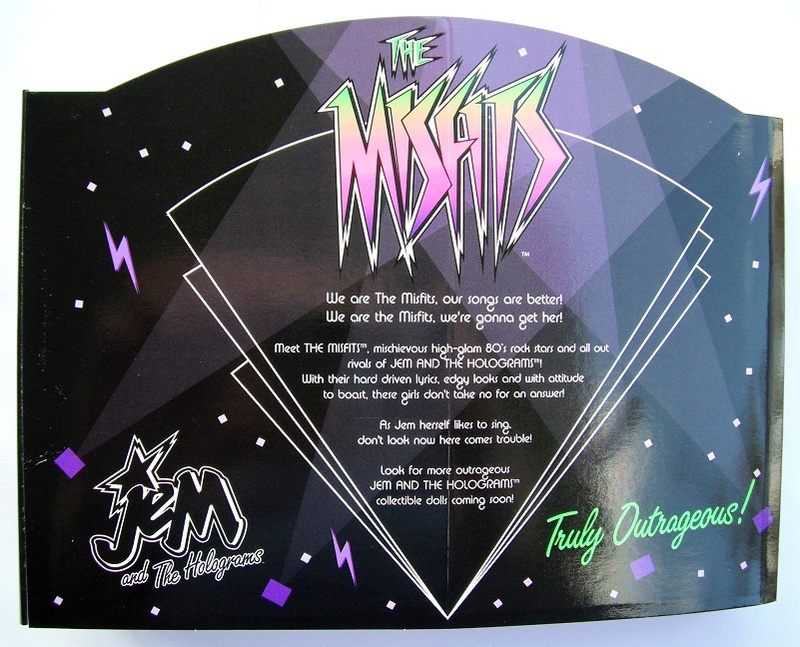 Some have chromed details, and the Misfits boxes even have their names written on them. 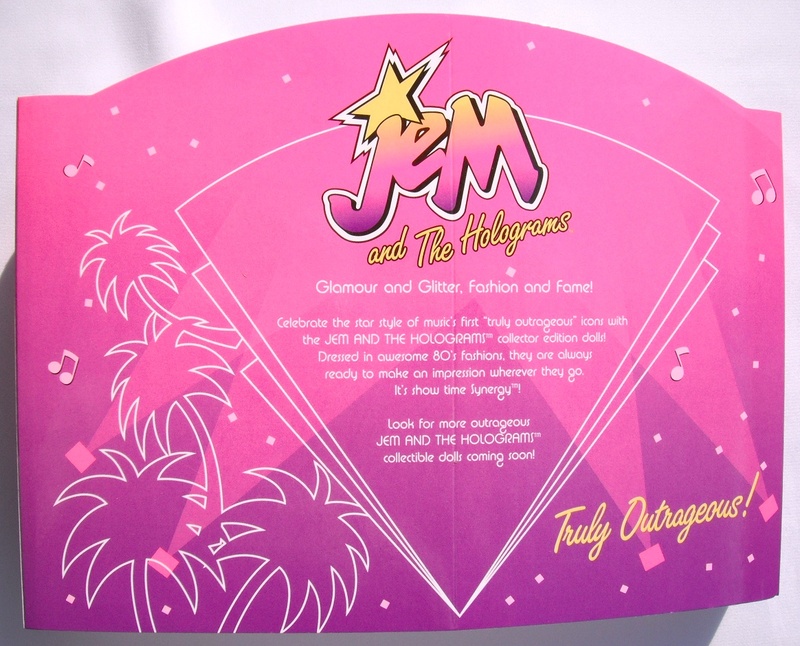 On their backsides, you can read a little introduction of the line along with the encouragement to look for more dolls soon. 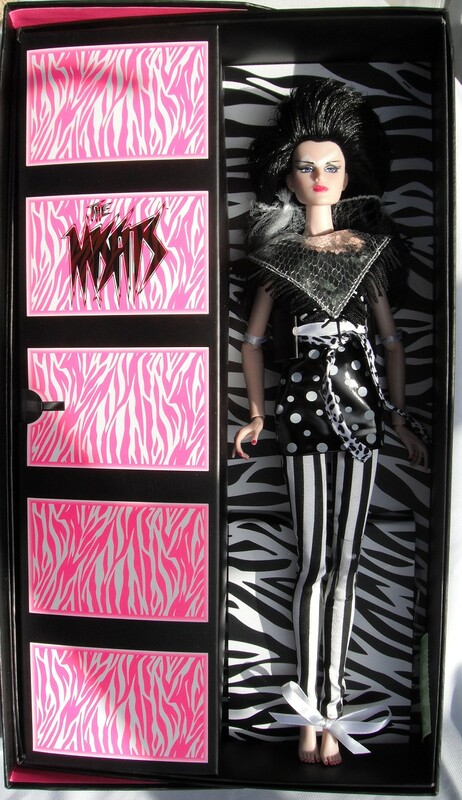 There were also sleeves written in both English and French released in Canada for the first wave.The specials dolls didn't come with sleeves. 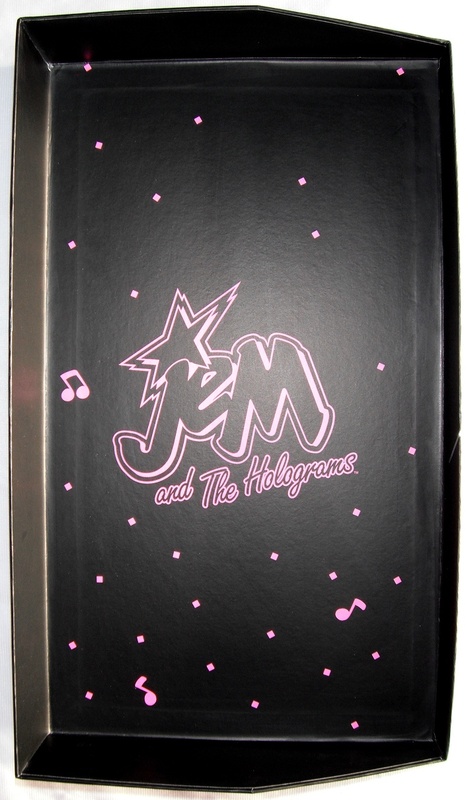 The inside of the front box. 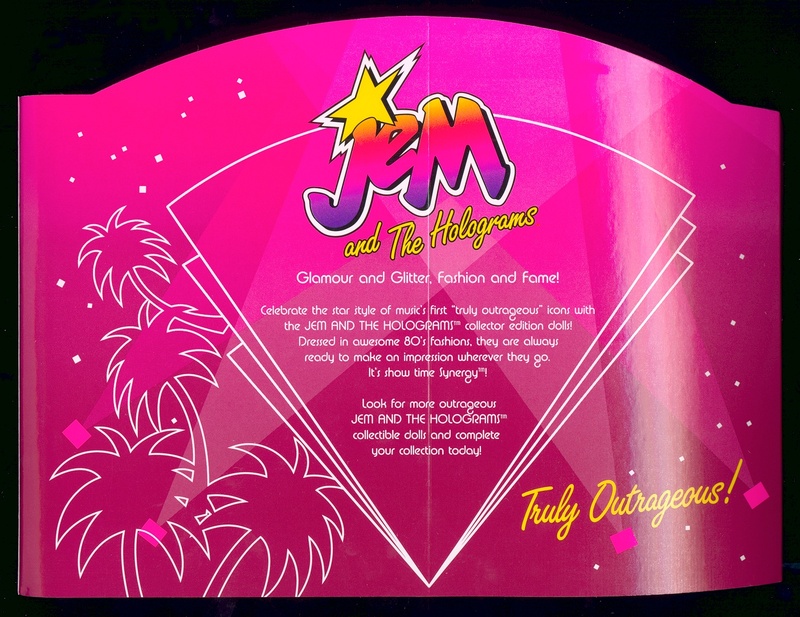 Several different designs. 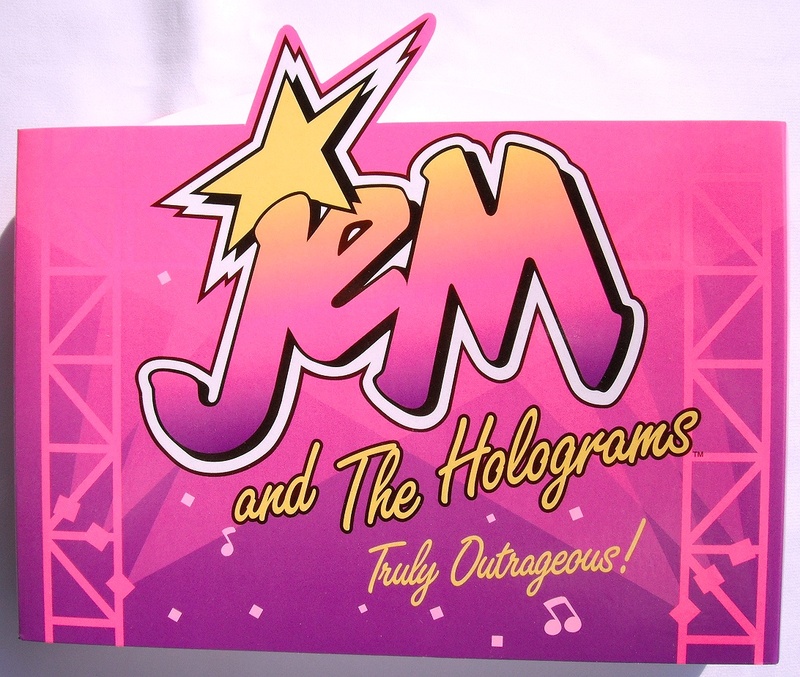 Most are actually black with a pink logo and notes and confetti, for Holograms and friends and stage essentials. 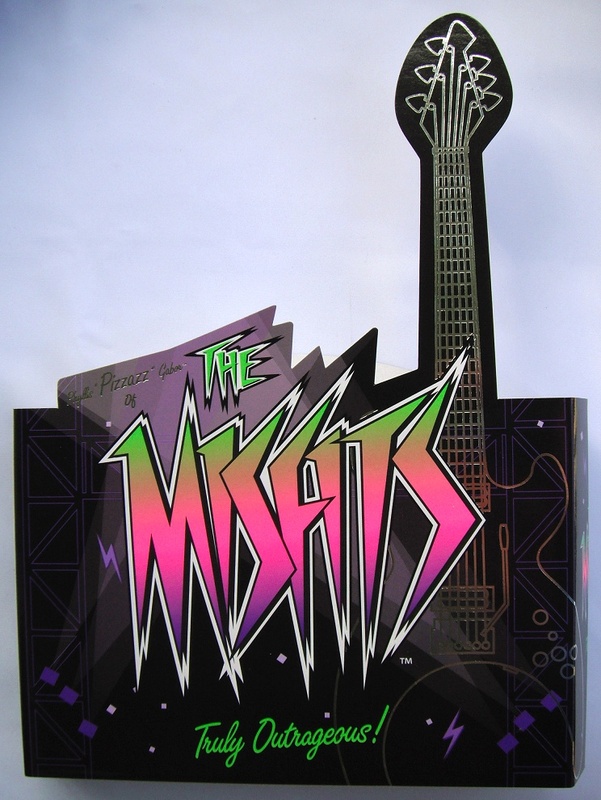 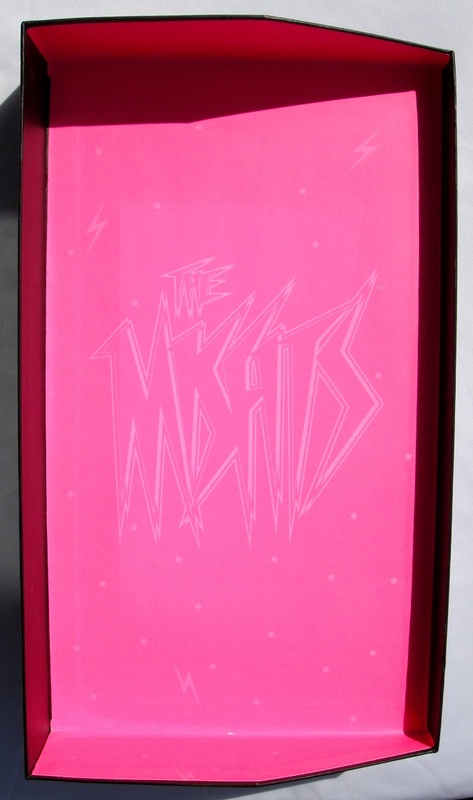 Some have a pink background with a bright pink logo, like the Misfits and special releases. 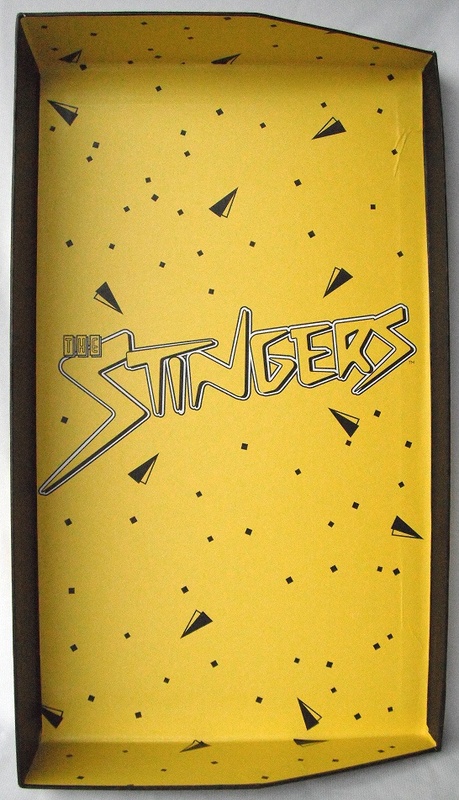 The Stingers ones are of course yellow. 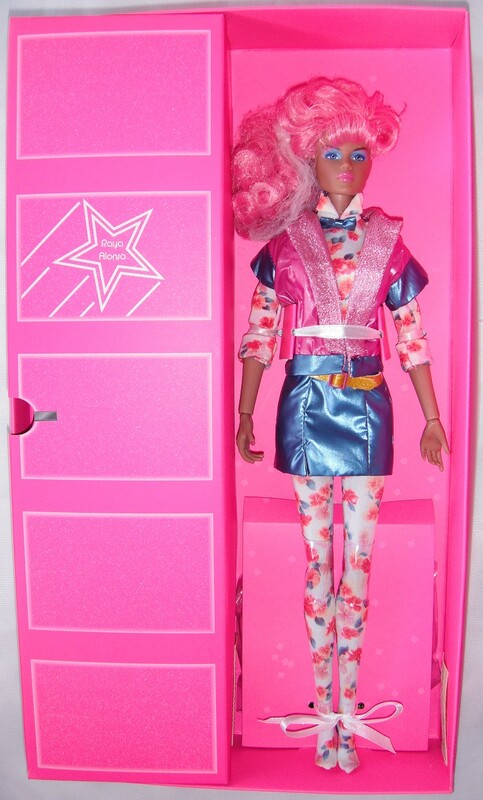 The dolls are all tied with white ribbons, around their waist and legs. 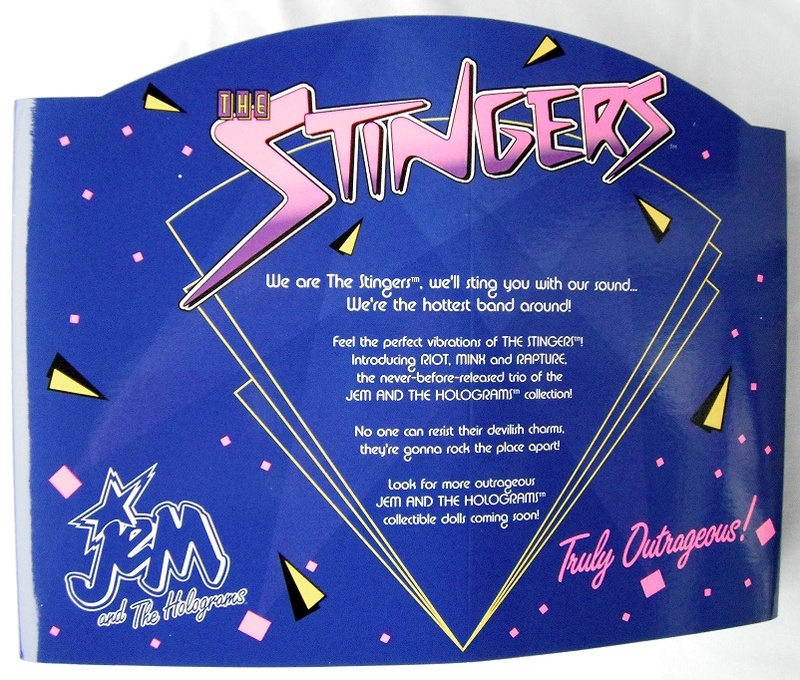 They come with their hair in a hair net to keep the hairstyle in place, while the entire head is secured with a a clear piece of plastic. 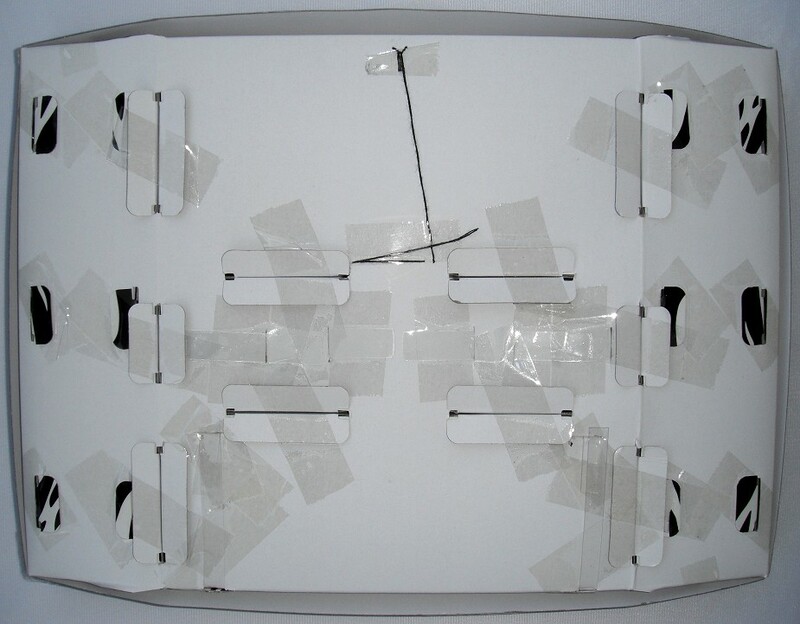 Around the knees is a softer clear plastic piece that is taped togheter. 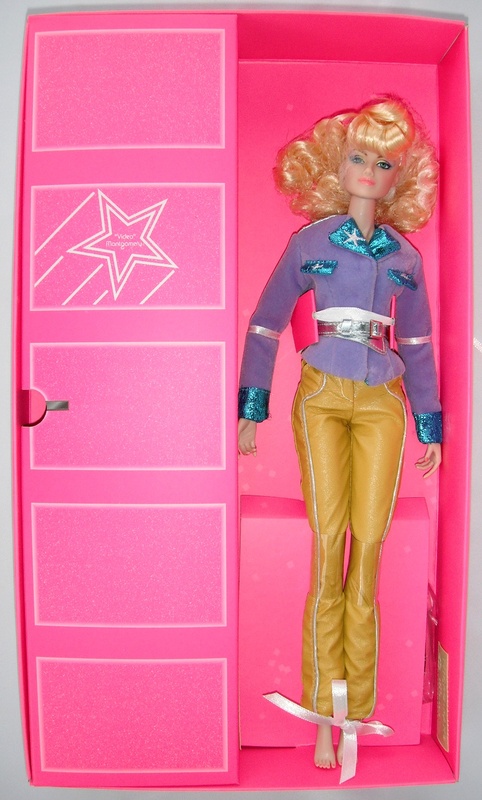 At the bottom, behind the doll's legs and behind a layer of cardboard, is the base of the stand. 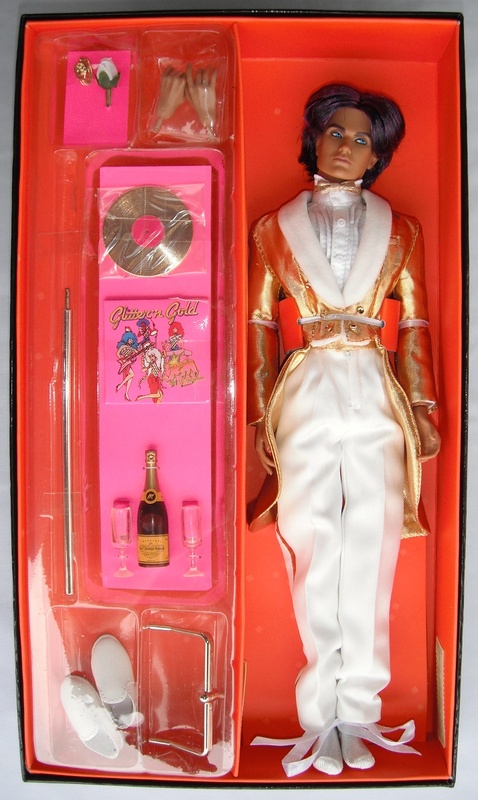 To the left of the doll is a lid that can be opened, where the clear plastic container of the accessories is located. 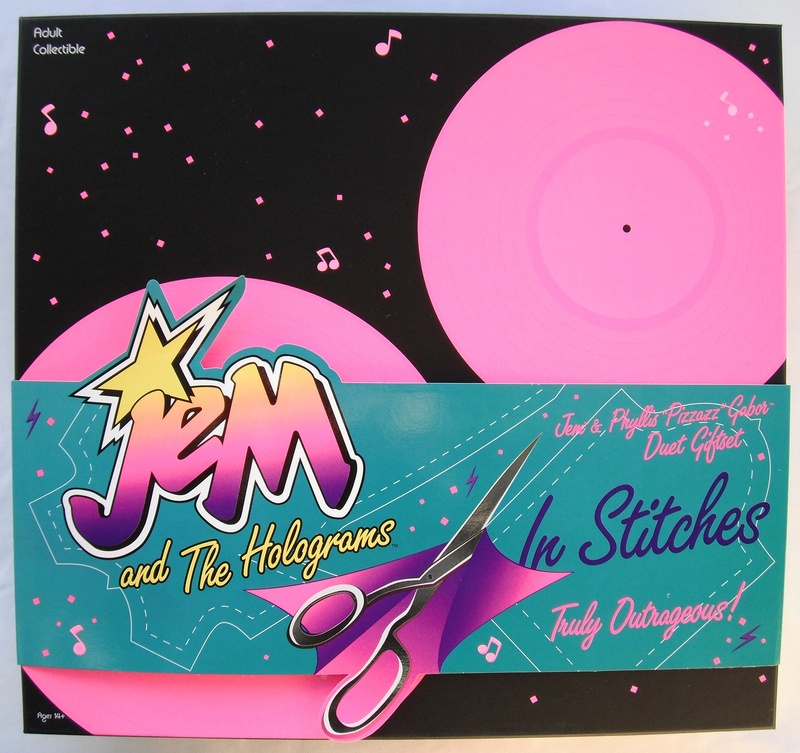 As you can see, after Hollywood Jem, most dolls follow a certain theme, like Holograms and friends, Misfits and Clash, Stingers. 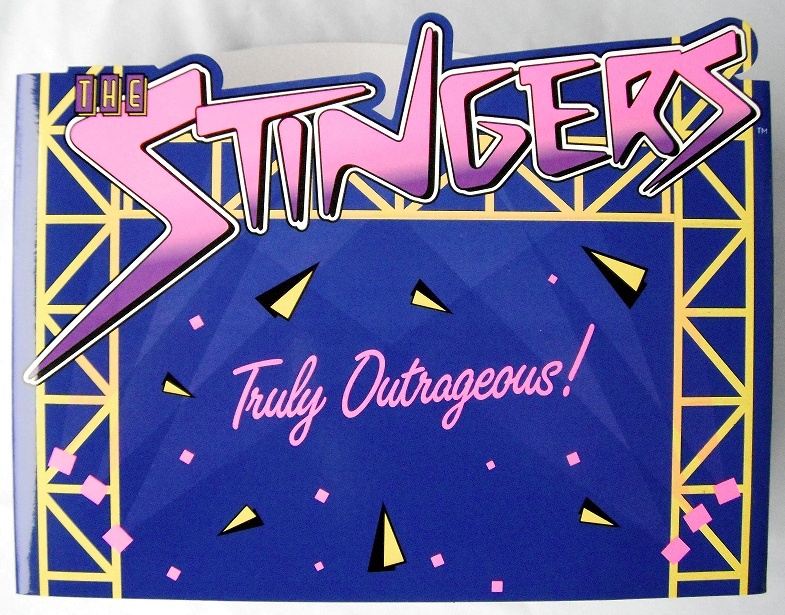 Synergy, Rio, and Danielle got their own design/coloring, and so did the did the specials and whoever had another reason like certain accessories that required a slightly different version. 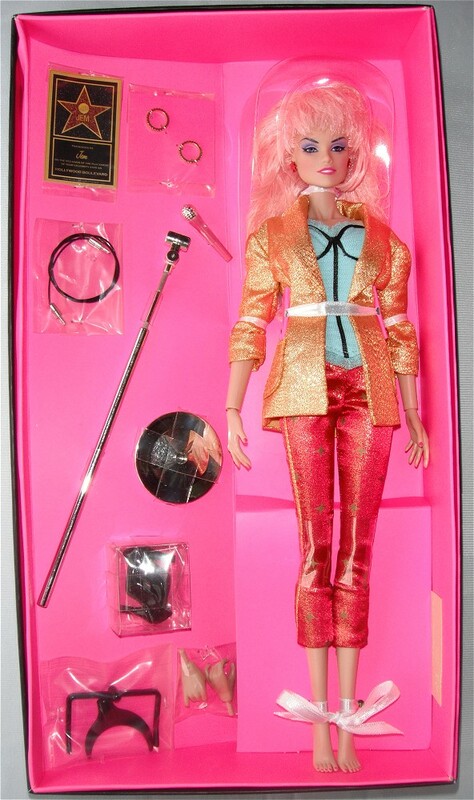 In this clear plastic container, on which you open the clear plastic lid, you find most accessories, like extra hands, shoes, instrument, cord, earrings, microphone stands, depending on what is included with that character. 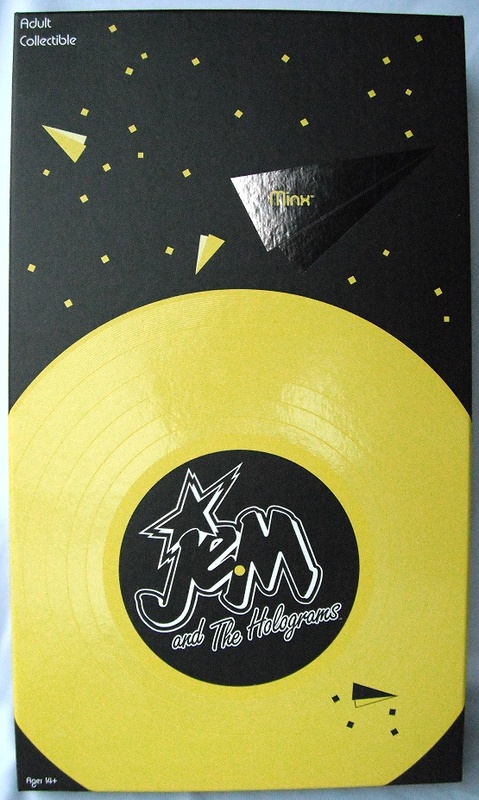 They're all carefully packaged, attached to cardboard pieces or inside little clear plastic bags. 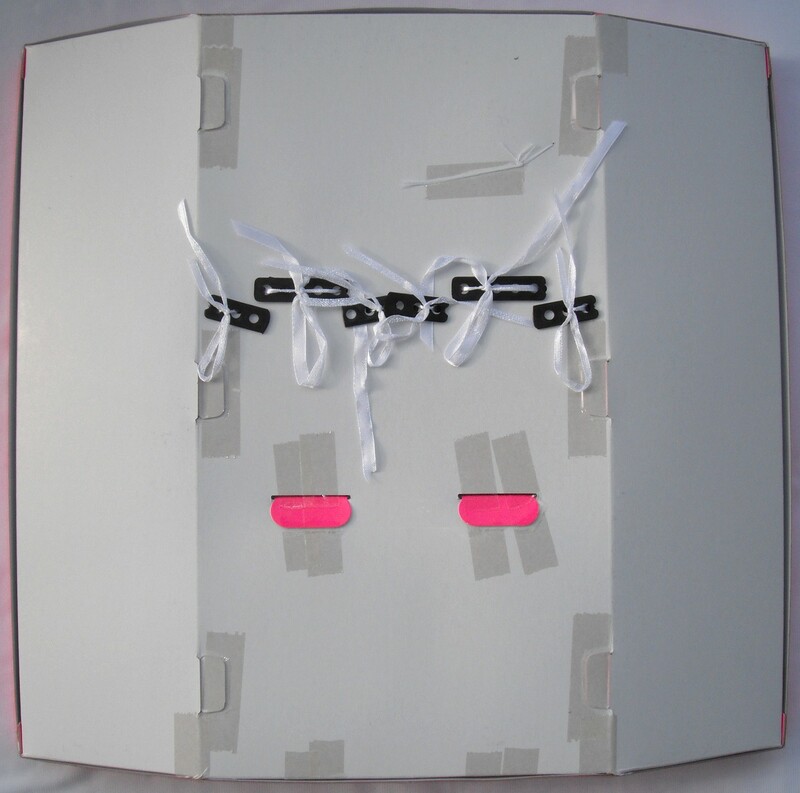 Just a few examples of different looks, nothing pretty but it wasn't meant to be. 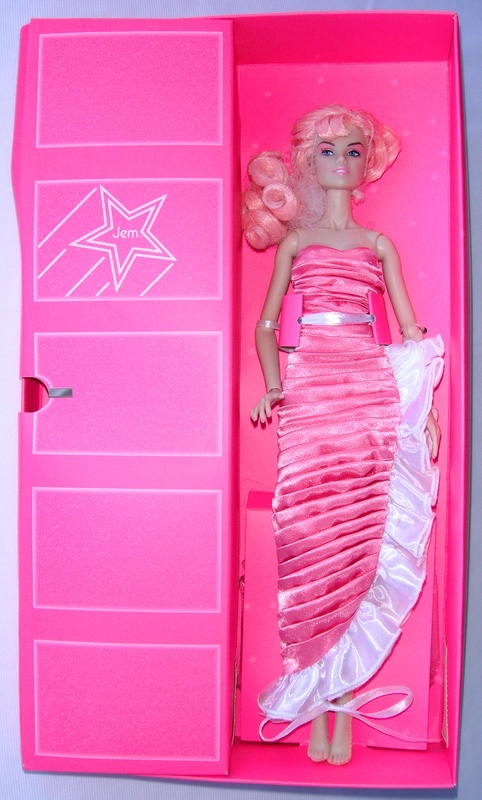 But here you can see how the dolls were packaged on the reversed side of the liner. 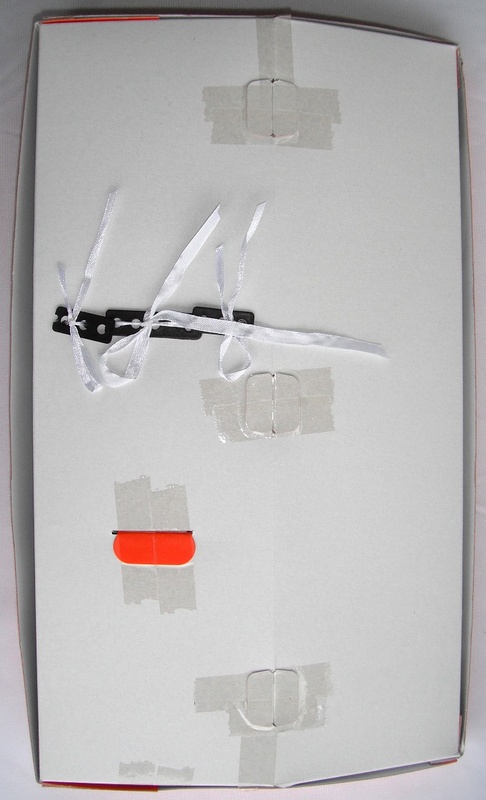 With black plastic pieces where the white ribbons are tied through, and even threads that are to be cut when certain parts sewn to the cardboard to be kept in place. 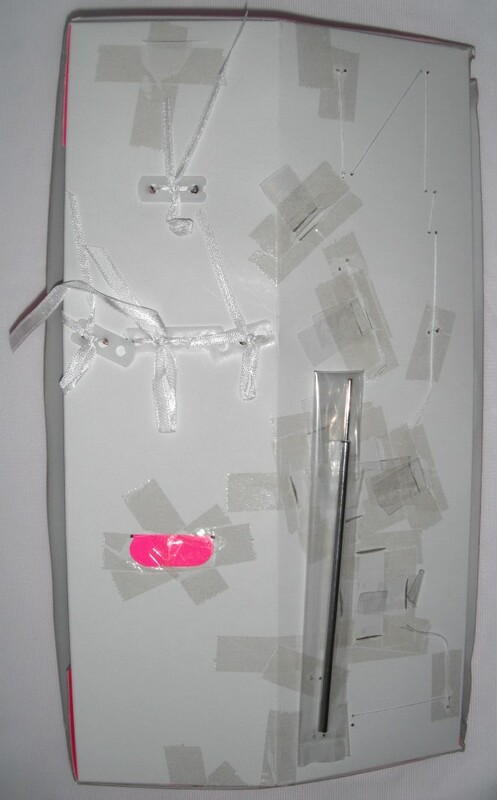 And lots of tape. 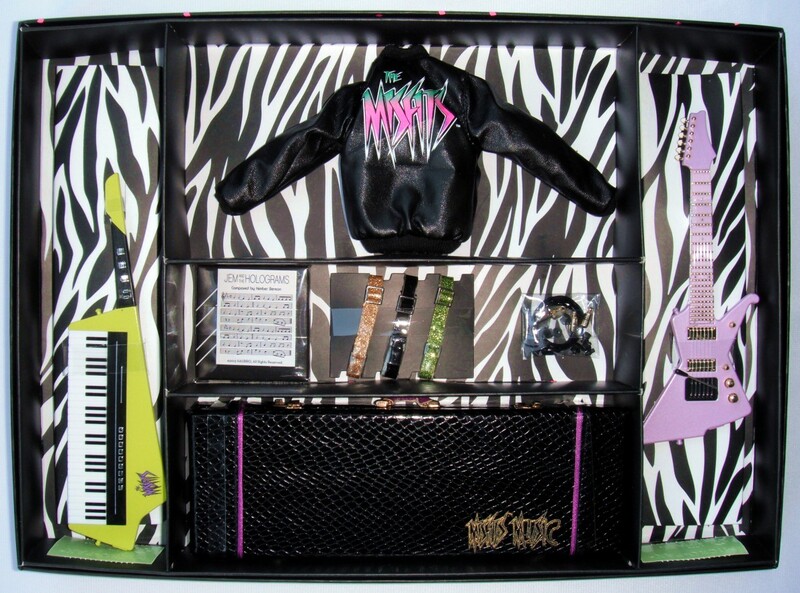 Sometimes there were even more black plastic pieces, and sometimes even accessories that would fit with the other accessories, are put here, like parts for the stands. 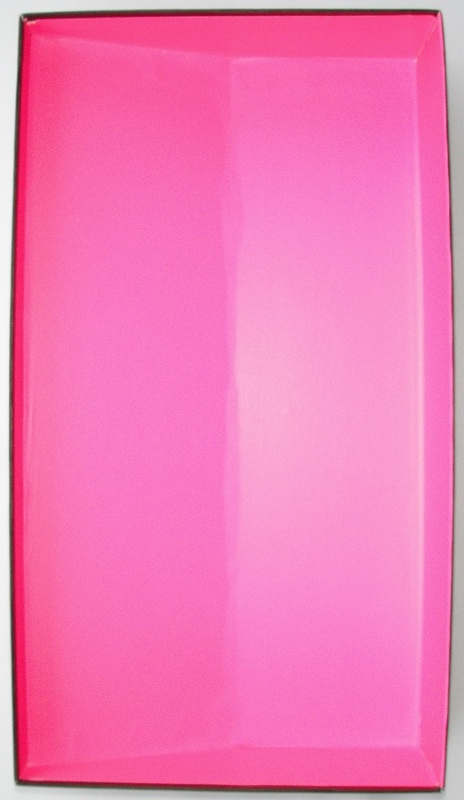 Only one color and no decorations, usually black. 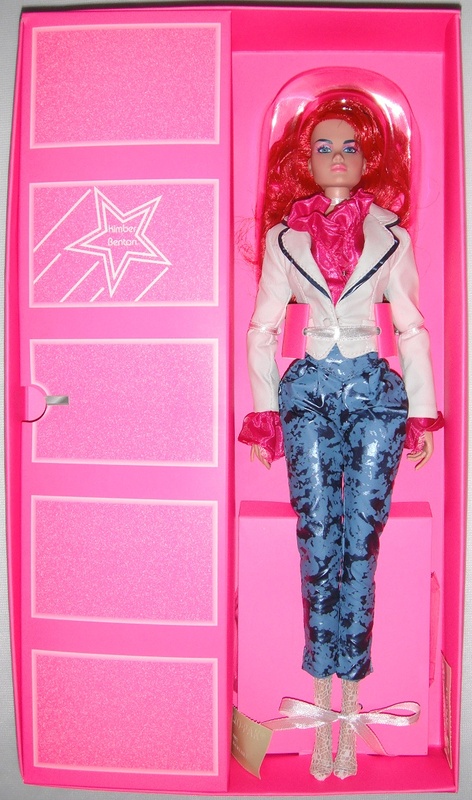 This is what's underneath the liner with the doll. 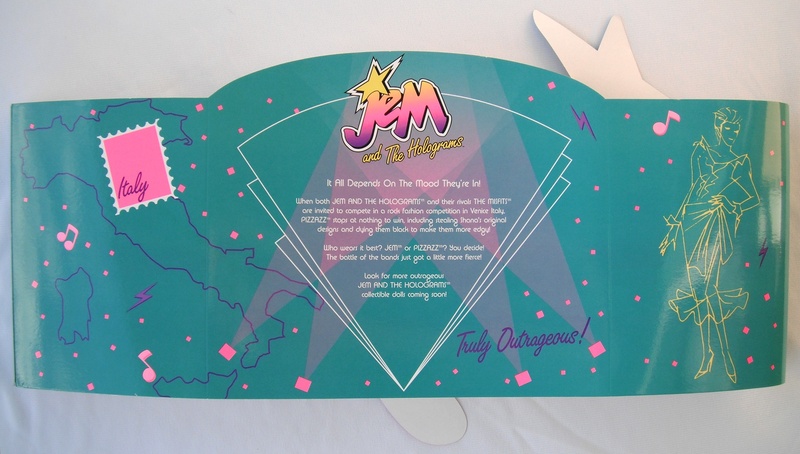 Here you will find things like the certificate and the intructions when included, in a clear plastic bag. 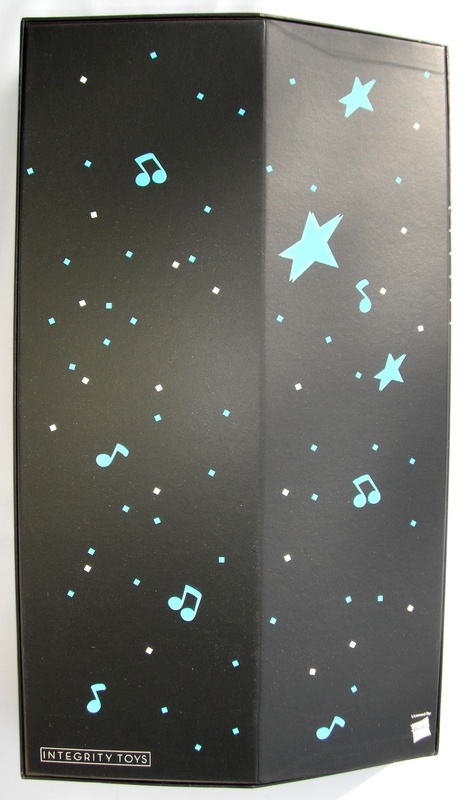 The same black background with colored stars, music notes and confetti as on other parts of the packaging. 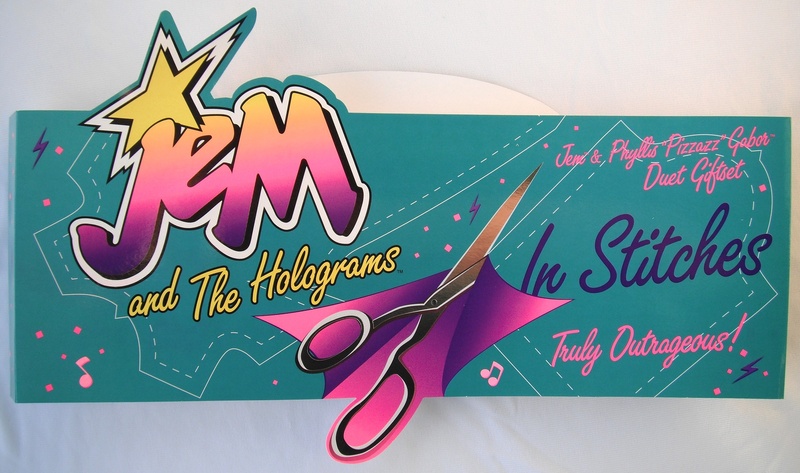 While the special dolls, which didn't come sleeves, had text written here. 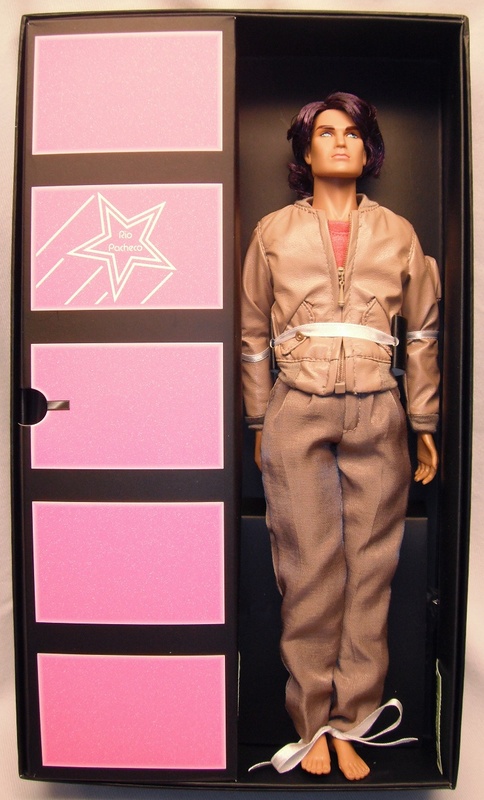 With Integrity Toys and Hasbro logo in white or colored. 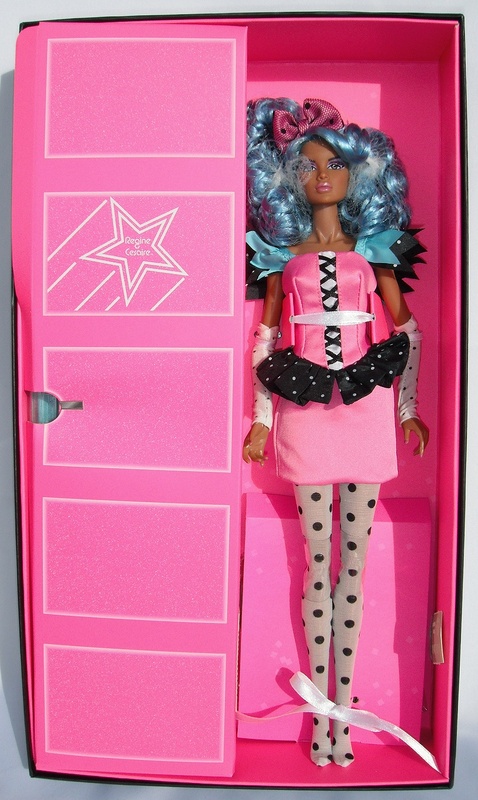 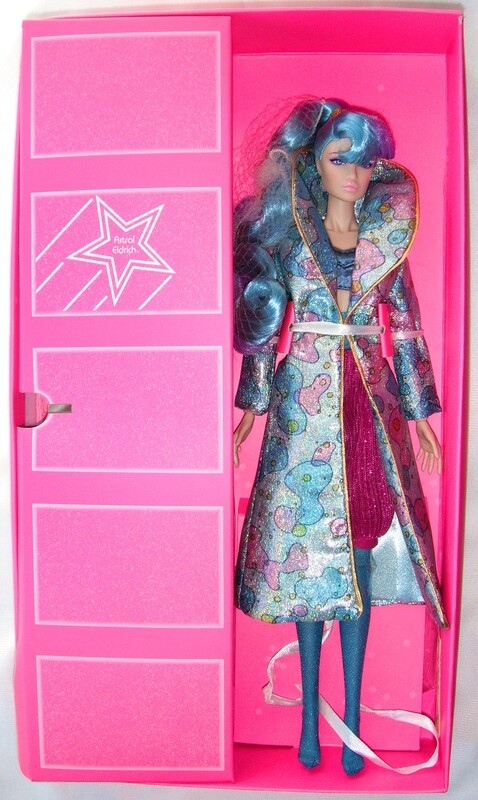 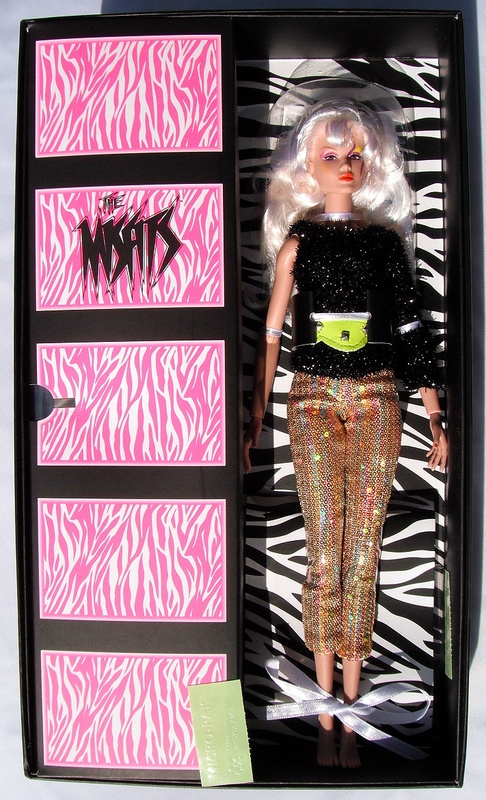 Same color as the fronts, along with logo and stars/hearts and even says "Truly Outrageous", and sometimes the name of the doll as for the specials. 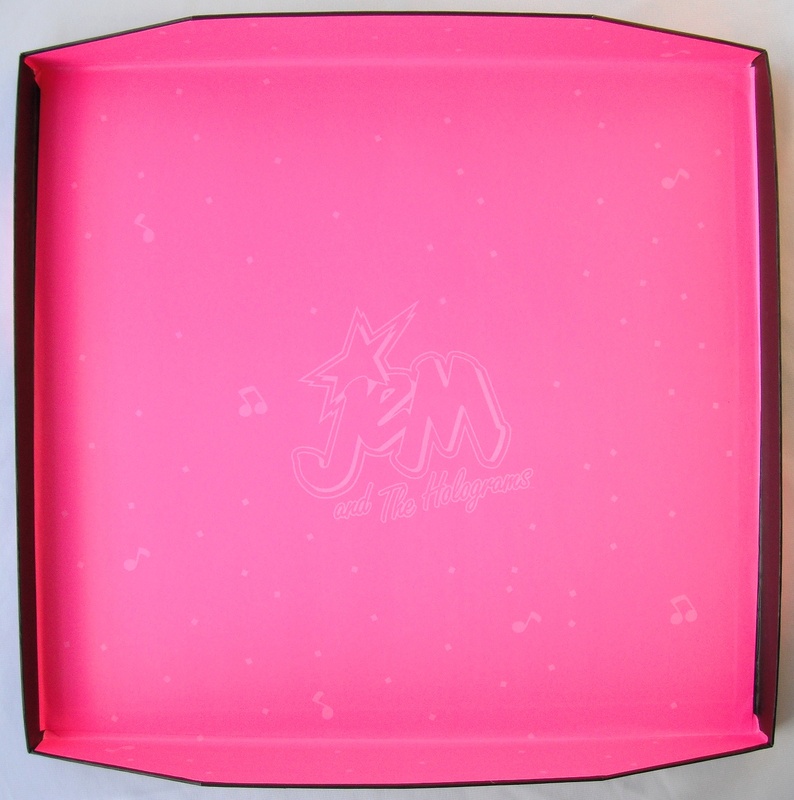 Here you can tell the shape of the boxes, and the diagonal side of the box is where the accessories are located inside. 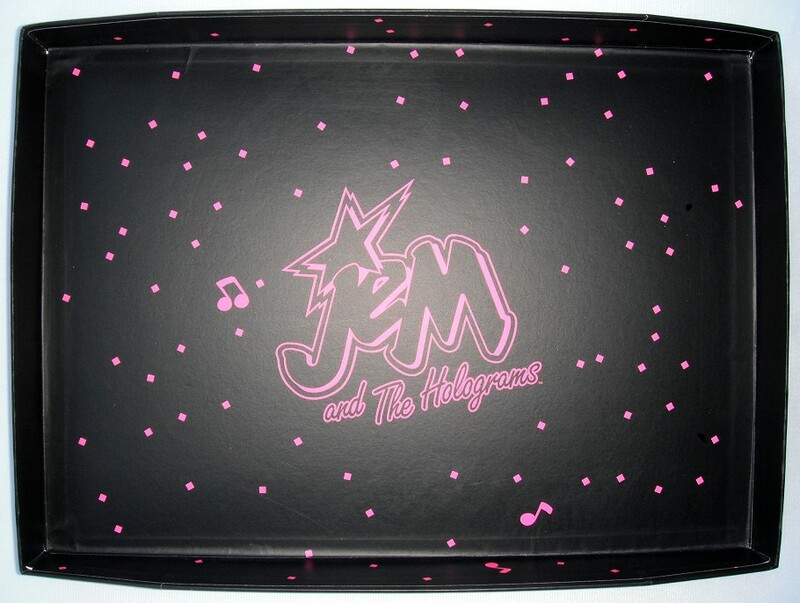 All the details such as warning for choking hazard, pin code, logos, copyrights, adress to Integrity Toys, where it was made, and even the URL to the official Integrity Toys Jem Collectibles site. 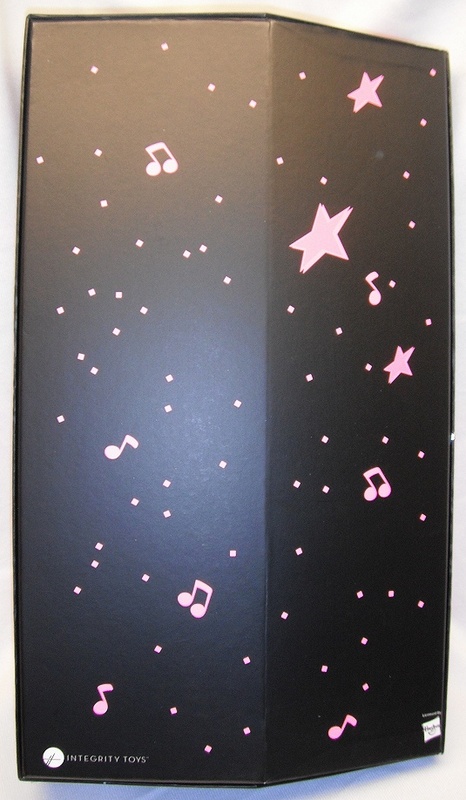 Atleast one side is pictured here, the larger one where there's some room for the same design as the front and top, with logo and stars/hearts.